Crude Oil Daily: Has the gold rush come to an end? NEW YORK (AP) -- When the price of gold plunged $200 last month, many people thought they caught the sound of the gold bubble popping. What Peter Schiff, CEO of the brokerage Euro Pacific Precious Metals, believes he heard was a stampede of fair-weather speculators fleeing the precious metal. Schiff and other champions of gold weren't shaken by the plunge. To them, it was just a short breather in preparation for another long climb. All the reasons they give for buying gold haven't changed: gold remains a refuge from disaster, they say, arguing that a steep drop in the dollar and a spike in the price of consumer goods are a threat. For speculators, buying gold was simply a way to profit from its popularity. "That's what happens in a bull market," Schiff says. "The selloffs shake out the Johnny-come-latelies. It's healthy. Now we can have a real rally." Gold, often touted as the most trustworthy of investments, has looked wild over the past month. After starting April above $1,600 an ounce, it dropped below $1,361 on April 15 and has steadily recovered to settle at $1,436 on Friday. But gold was supposed to be a haven from turmoil. When the housing market started cracking and the stock market sank in 2007, the price of gold began to surge. Over the next two years, it soared from around $600 an ounce to nearly $900 in the depths of the financial crisis in late 2008. For those who were wary of financial institutions or thought the Federal Reserve's rescue efforts would backfire, it became the favored investment. The television personality Glenn Beck advised his audience to stock up on gold bars in case the dollar became worthless. The tea party called for a return to linking the value of the dollar to the price of gold. "People treated gold like the cure for everything," says James Paulsen, chief investment strategist at Wells Capital Management in Minneapolis. "If you were worried about a depression, buy gold. If you were worried about inflation, buy gold." Fear of economic collapse started the gold rally, and greed accelerated it. By 2009, speculators and others looked to ride gold's popularity. Hedge funds and other big investors piled in. Anxiety and gold prices kept climbing in tandem. Right after Standard & Poor's stripped the U.S. of its top credit rating in August 2011, the price peaked above $1,900. Instead of buying gold bricks and stashing them in their basement, many hedge funds and big investors turned to buying gold exchange-traded funds, which trade on markets like stocks. The most popular offering, the SPDR Gold Trust, attracted big investors like John Paulsen, who made billions betting on the mortgage meltdown, and George Soros. As money poured in, the SPDR Gold Trust grew into the second-largest exchange-traded fund behind the SPDR S&P 500, which follows the stock market. And its supply of gold swelled from 780 metric tons at the start of 2009 to 1,353 metric tons in December. But now it looks like the fast-money has soured on the yellow metal. George Soros slashed his stake in the SPDR Gold Trust fund by 55 percent at the end of last year, according to the most recent regulatory filing. Judging by the numbers, it looks like others decided to jump out of the market at the same time. 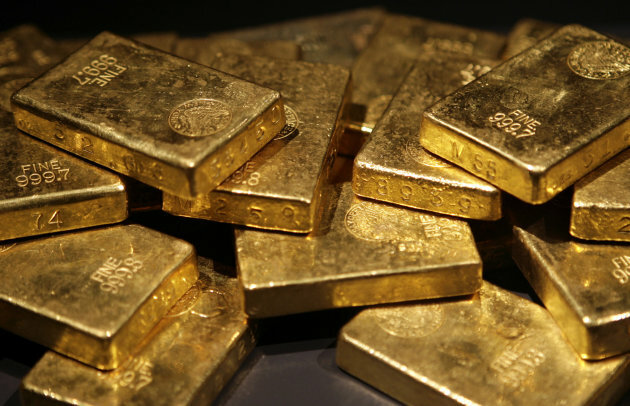 Hedge funds and big investors pulled $8.7 billion out of gold funds last month, according to EPFR Global, a firm that tracks where big investors put their money. EPFR says it was the biggest monthly withdrawal out of gold funds since the firm started collecting data in 2000. The SPDR Gold Trust unloaded 12 percent of its gold in April, selling 146 metric tons. There's no single destination for all the money rushing out of gold, says Cameron Brandt, EPFR's director of research. The most popular places for investors now are real estate funds, junk bonds, emerging-market bonds and stocks in big companies that pay dividends. One clear trend that Brandt sees is investors pulling cash out of the safety of money-market funds in search of something better. Some of that money appears to be trickling back into the U.S. stock market. So where's gold headed next? The answer depends partly on where you think inflation is headed. At one extreme, Schiff and others in his camp believe the Fed will eventually let inflation loose and gold will hit $2,000. "They're going to print and print until money is worthless, or they run out of trees," Schiff says. "I think people will look back at this time period and think, 'Wow, what a great opportunity.'" Others see no reason for gold to resume its climb. They point to a recent academic study that said current consumer prices imply a gold price below $800 an ounce. Gold forecasts from Wall Street banks sit somewhere in the middle. Samuel Lee, an ETF strategist at Morningstar in Chicago, has less than 5 percent of a portfolio he manages in gold, and plans to keep it that way. He considers gold a protection against inflation over the very long-term — from 50 to 100 years. Lee says he isn't sure where gold prices are going this year or the next, "but I'm convinced they won't do as well as stocks." He adds, "I'm not really a big believer in gold. I'm fully aware that it can lose me a lot of money. I just care that it gives me some diversification." With banks looking stable and the economy slowly improving, there's lets of a need to hide in the gold market. Fear of another financial crisis has diminished. Ralph Preston, a market analyst and broker at Heritage West Financial in San Diego, Calif., envisions a few scenarios in which gold could shoot higher this year. If the war in Syria spreads, or if North Korea launches an attack on other countries in Asia, it could head back above $1,900. "Owning a little bit of gold is probably not a bad idea," he says. "But I don't think we'll be using it to buy groceries someday."